Nashik : The Nashik Kumbh Mela, which is generally acknowledged to be the most sacred of all the hindu festivals, has begins today morning at 6:16 am, when Jupiter (Bruhaspati), Sun and the Moon enter the Leo constellation (Simha rashi). Simhastha Kumbhmela will begin with a flag hoisting, in the presence of union home minister Rajnath Singh and Maharashtra chief minister Devendra Fadnavis. n 2015, Nasik will again get an opportunity to host guests from every spot of the country and from all walks of life as Kumbh Mela will be held in Nasik from July 14 to September 25 of that year. The flag known as Dharma Dwaja - will be hoisted at Kushwarta teertha at around 6.13 am, by Acharya Mahamandaleshwar Juna Peethadhishwar Awadeshanand Maharaj from Haridwar. The flag hoisting at Nashik will be done at Ramkund in the presence of gaurdian minister of Nashik Girish Mahajan. 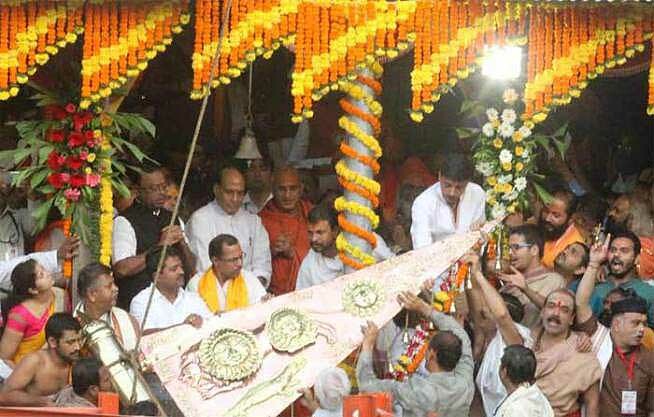 The Nashik Dharma Dwaja will be hoisted at Ramkund at 6.16 am. The flag has symbolic significance and announces the beginning of the parva - the period, It will be lowered only after the mega event is over after a year. According to Purana (hindu holy book), origin of river Godavari has special importance because Gautami ganga was named Goda at Trimbakeshwar Kushawarta Tirtha. This means cow of sages Gautam got her life and Sages Gautam was freed from the murder of a cow, as Gautam took bath at Kushawarta Tirtha, Gautami Ganga was named as Godavari (Sages Gautam stopped the flow of ganga with holi kusha (Darbha) and had holy bath.) Hence this place is named as Kushawarta.